The Boneyard Creek watershed includes the downtown area and “Campustown” a business area adjacent to the University of Illinois. The banks of Boneyard Creek were eroded due to major flood events and deteriorating recreational facilities located in the Scott Park area. In order to improve flood flow conveyance through the park, channel improvements were constructed as Phase 1. Phase 2 consisted of drainage improvements, the addition of a detention basin and construction of a storm sewer. To connect the street, sidewalks and path throughout Scott Park; one pedestrian bridge, one full street and sidewalk crossings were needed to cross the waterway and basin. “Boneyard Creek dissected the park into two disjointed halves, greatly impeding pedestrian circulation and overall enjoyment by forcing park visitors to walk up to the surrounding streets to cross the creek and access the other side” stated John Dabrowski, P.E., Senior Project Manager at Foth Infrastructure & Environment, LLC. Two CON/SPAN® Bridge Systems were chosen for the improvements. Utilizing a standard beam/slab bridge would have required that several critical utilities be relocated and, by choosing the CON/SPAN system, the utilities were able to remain in place. Overall, the CON/SPAN Bridge System saved time and money for the City of Champaign. A 32’ x 9’ CON/SPAN was utilized as a pedestrian overpass about midway through Scott Park and provided passage over Boneyard Creek. 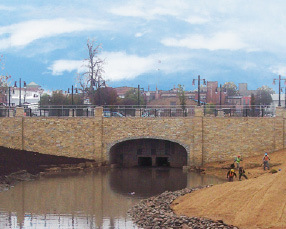 The second CON/SPAN, 32’ x 12’ in size, was utilized as a faux bridge in the detention basin portion constructed during Phase 2. Both structures feature an aesthetic stone facing, complementing the overall theme of the improvements. “The CON/SPAN bridge system allowed us to achieve the desired look while satisfying the hydraulic and structural requirements” stated Adam Bohnhoff, P.E., Design Engineer with Lin Engineering. A ribbon cutting ceremony was held to celebrate the completion of the Phase 2 construction, a part of the two decade effort to alleviate downstream flooding along the Boneyard Creek.